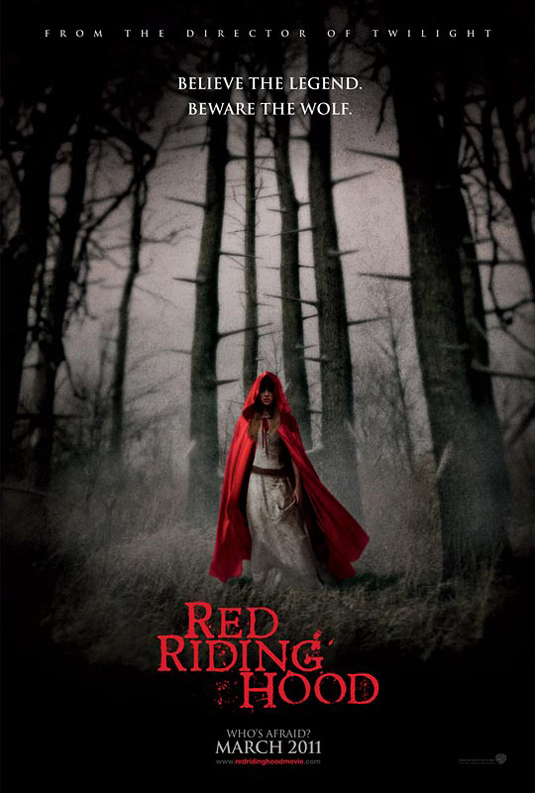 Red Riding hood is an upcoming film starring Amanda Seyfried, a dark take on the children's fairy tale. Valerie (Seyfried) is obviously a beautiful girl in a village who is in torn between two men, an outcast she deeply loves and a man her family has arranged to be her groom. Upon arranging to elope with her true love, the werewolf (yes, werewolf) kills Valerie's sister, despite the regular animal peace offering the village gives to the beast. The town hires a wolf hunter who suspects the werewolf is in fact someone within the village (given they take human form during the day) making Valerie extremely cautious of her relationships and even suspects her lover to be the wolf, this connection making her vulnerable, yet in a position of control over him. I love the idea of turning these innocent happy fairy stories into dark gruesome tales, and I think this film has the plot in the right lines. Despite being made by the director of Twilight (the similarities are somewhat obvious), this film will surpass the popular quadrology as it is less of a "teen" flick. I love the mystery and suspense that the story can bring. There is an element of "Cluedo" here- a guessing game of who the werewolf is.